The browning and dieback of over 100,000 acres of smooth cordgrass (Spartina alterniflora) served as a dire call to action for Louisiana's coastal science community. This 6-part series explores the response to that call, from satellite imagery to laboratory studies of individual plants. On May 15, 2000, Greg Linscombe, a wildlife ecologist with the Louisiana Department of Wildlife and Fisheries (LDWF), noticed something curious during his helicopter survey of so-called "nutria eat-outs" along the state's coast. While the troublesome, marsh-devouring rodents leave behind signature trails and grazed areas that indicate their presence and relative abundance, Linscombe was encountering something entirely new. He had seen pockets of stressed smooth cordgrass (Spartina alterniflora) during his 30 years in the field, but he had never see the large, multiple tracts of browned areas he observed that day, tracts that looked more like the grass usually does during its winter dormancy rather that the vigorous greening more typical of spring. 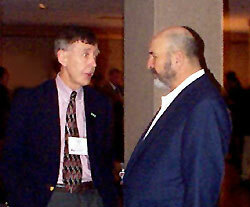 Louisiana Governor Mike Foster (right) and U.S. Geological Survey Director Charles Groat (left) discuss the magnitude of the problem at the Coastal Marsh Dieback conference held January 11-12, 2001 in Baton Rouge, Louisiana. Little did Linscombe know that the report he would share with fellow researchers after his Bell Jet Ranger touched down would be the first warning sign in what would prove to be a full-blown coastal crisis. Over the next several months, the "brown marsh phenomenon," as scientists in Louisiana dubbed the dieback, would explode into an unparalleled coastwide browning of Louisiana's intertidal smooth cordgrass that alarmed even the most seasoned coastal observers. And ever since Linscombe's report, scientists across Louisiana's gulf coast have sought to explain what amounts to a troubling ecological "whodunit." Smooth cordgrass is the dominant marsh grass species constituting the seaward margin along North America's eastern and gulf coasts, in much the same way that mangroves do farther south. But more than simply the widespread death of a single plant species, the concern was over the fate of Louisiana's entire coast, a region that has already had enough trouble holding its own over the past century. During that period, the increasing number and height of levees designed to prevent the Mississippi River from flooding have continually decreased the amount of marsh-sustaining fresh water and sediment flowing into the neighboring wetlands. At the same time, dredging of innumerable channels central to the oil and shipping industries has profoundly changed the interior hydrology, creating new avenues for salt water to penetrate inland. With the scales thus tipped towards ever-higher salinity levels, inland marsh species with lower salt-tolerances than smooth cordgrass-the most salt-tolerant of them all-often find themselves outside of their tolerance levels, especially at the edges of estuarine systems. 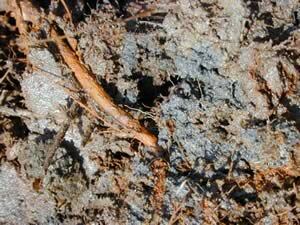 When these plants die, the root systems that bind the submerged soil decay and collapse. As the soil surface drops, the substrate often lowers to the extent that no plant species is able to recolonize. 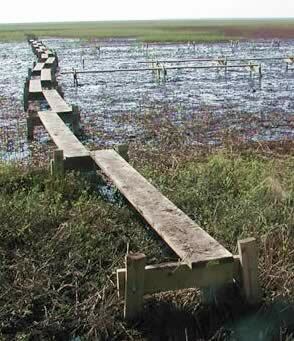 Rendered vulnerable to wind and wave erosion, once functional wetlands soon convert into open water. And as the salt water encroaches ever inland, this destructive cycle plays itself out again and again. Read Governor Foster's proclamation issued October 23, 2000 in which the scope of the problem is outlined and a state of emergency is declared in four south Louisiana parishes. Read Governor Foster's executive order of October 27, 2000 authorizing the Brown Marsh Project research program. A series of three images taken at ground level. One shows healthy smooth cordgrass, another an example of the stressed, brown marsh, and another the mud flats created after the marsh dies. A tract of healthy smooth cordgrass sporting the lush green blades usually seen during the spring and summer months. A tract of unhealthy, "browned" smooth cordgrass. Well over 100,000 acres would wind up being afflicted across Louisiana's coastal zone. After the smooth cordgrass dies, it rots and decays, leaving open mud flats like this one behind. Because the root systems that help to bind the soil decay as well, these areas are then easily washed away when inundated by rain or tides. Despite a decade's worth of successful mitigation efforts, Louisiana still suffers 25-35 square miles of coastal wetland loss each year. Hence, the challenge of suddenly facing a massive browning and dieback that extended farther inland was met with a great sense of urgency by both the state government and the coastal preservation community. For example, the Barataria-Terrebonne intertidal salt marshes, which alone cover some 390,000 acres, had 110,000 acres severely affected by the dieback. By year's end, 17,000 acres had converted from dense vegetation to open mud flats that were simply waiting to be washed away, and about 90,000 more acres seemed poised to meet the same fate. It was in the midst of this escalating climate of crisis, then, that the state seized the initiative. Coordinated through the U.S. Geological Survey's National Wetlands Research Center (NWRC) in Lafayette, researchers from several agencies and universities were surveying the situation from both the air and ground by early June, mere weeks after Linscombe's initial report had been filed. At the same time, Louisiana Governor Mike Foster directed his Executive Assistant for Coastal Activities, Len Bahr, to work the problem. 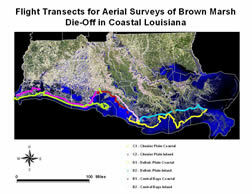 With emergency funding secured through the Governor's Office, the Louisiana Department of Natural Resources (LDNR), and the Coastal Wetlands Planning, Protection and Restoration Act (CWPPRA), Bahr's office saw to it that a more thorough and fully quantitative helicopter survey was flown, a preliminary analysis of oceanographic data was drafted, and that high-resolution infrared photography of the region was acquired. As these and the USGS reports were beginning to come in, Bahr prepared memoranda for Governor Foster that summarized the situation to date, the need for an emergency proclamation, and the rationale behind the request for emergency congressional funding. As per Governor Foster's order, the task of organizing these collaborative teams into a coherent research program was handled by the Barataria-Terrebonne National Estuary Program (BTNEP), one of the 20 National Estuary Program's regional centers across the nation. BTNEP's quasi-public status made it the ideal vehicle for such a challenge, coordinating, as it regularly does, with universities, private industry, and a host of government agencies at the national, state, and local levels. By mid-January, a two day conference held in Baton Rouge brought together hundreds of investigators from across a broad spectrum of disciplines, including hydrology, climatology, biology, ecology, chemistry, wildlife management, economics, and remote sensing. The researchers came prepared to talk about what had been learned from the preliminary investigations, and, more ominously, how little certainty existed concerning the dieback's spread, the chances for recovery, what the next growing season might bring, and-almost unthinkable-what the results would be if a hurricane were to hit. In addition to Governor Foster's attendance, the gravity of the problem was underscored by the presence of Dr. Charles Groat, the Director of the U.S. Geological Survey, and Dr. Donald F. Boesch, the president of University of Maryland's Center for Environmental Sciences. As an outgrowth of Governor Foster's executive order, the BTNEP framework, and the free exchange of ideas facilitated by the conference, a comprehensive "Brown Marsh Project" study team was formed. The project, it turned out, would be every bit as unprecedented in the field of gulf coast science as the brown marsh phenomenon it was undertaking. Because the effort was composed of 32 "tasks" and led by 64 principal investigators drawn from 17 institutions and private entities, coordinating the project's work flow, ensuring a common nomenclature among the disparate disciplines, and constructing a transparent database for a wide variety of computer-based analytical tools was a daunting challenge in and of itself. Beyond the question of coordinating the massive effort, however, was the question of funding. Instrumental in this regard was Louisiana Congressman Billy Tauzin. Tauzin spearheaded the authorization of $3 million in emergency funding within the National Oceanic and Atmospheric Administration (NOAA) budget, part of the larger Department of Commerce appropriations bill. The bill passed in the waning days of the 106th Congress and was signed into law by President Bill Clinton on December 21, 2000. With the final framework and the requisite funding mechanisms squarely in place, the Brown Marsh Project was officially underway. Within the project were four broadly defined subprojects in which the 32 individual tasks would be classified. The tasks within the "Data Management and Synthesis" subproject were central to the success of the overall project because it was within this area that the mountains of datasets generated by the other 31 tasks would be housed and accessed. In addition to archiving the on-going data generated by observation and experimentation, the projected impacts of the dieback on plants, animals, and human socioeconomic activities were included in the Data Management and Synthesis subproject as well. 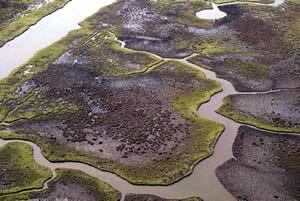 An aerial view of the brown marsh phenomenon, including healthy green marsh, distressed tracts and open mud flats. 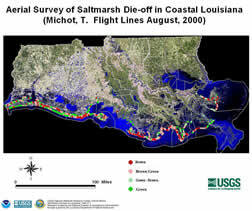 Over 100,000 acres in coastal Louisiana were similarly affected. Another subproject was "Status and Trends," the combination of imaging-based efforts and ground-level assessments aimed at identifying and mapping brown marsh so that the investigators would have a comprehensive picture of the situation with which to begin. A third subproject was the investigation of "Causes." 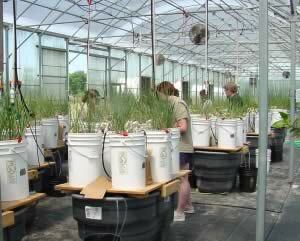 Perhaps the central, "$64,000 question" that the Brown Marsh Project aimed to answer, the search for causes looked at numerous environmental stressors in the field, in laboratories, and in greenhouses: salinity levels, hydrology, soil biogeochemistry, and "climatic drivers" such as rainfall and sustained high temperatures. The fourth and final subproject was "Remediation," the array of field and laboratory studies that examined ways in which the stressed plants and barren tracts could be nurtured back to health via strategies that included sediment deposition, aerial reseeding, and vegetative plantings. 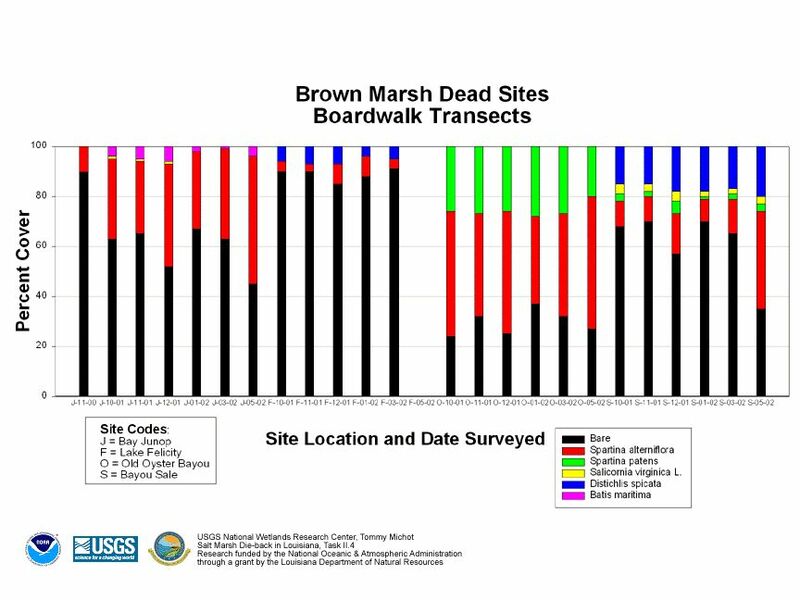 Aside from the science itself, perhaps the two aspects of the Brown Marsh Project that have most surprised the investigators are just how smoothly the effort has integrated different scientific disciplines and-when compared to the usual pace of scientific data gathering, analysis, and reporting-the blistering speed with which the project has moved. According to Len Bahr, "This is the first time the entire 'brain trust' of Louisiana's coastal science community has been brought to bear on a single project, and they realized at the outset that for this thing to work, cooperation and open lines of communication would be critical." But even given the commitment to work in a large, integrated effort, the Governor's Office, along with the project's participants, were pleasantly surprised at the speed at which the project has proceeded. As Paul Kemp, a coastal geologist with Louisiana State University (LSU), puts it, "When the brown marsh first appeared, it revealed our fundamental lack of knowledge regarding the role of the water balance in the larger ecological setting of the Louisiana coastal zone. But what we've seen over the last several months is nothing less than science moving at warp speed to answer this question in a comprehensive way." An essential task in the Brown Marsh Project was establishing and maintaining a data information management system (DIMS), an effort that is being led by Scott Wilson, an electronics engineer with USGS. In brief, the DIMS is serving as the central clearinghouse for all the information products that the project generates, including datasets, reports, and photographs. Because the primary purpose of the DIMS is data exchange, standardization of data formats has been a key in achieving a sense of data "transparency" for the wide variety of users. And in addition to serving as a data clearinghouse for all researchers involved, the DIMS also has a public access side. As of this writing, some 20 project tasks have posted findings and datasets on the public side. One of the most important aspects of any DIMS is the degree to which users are able to search through and find the data it houses. Of course, if users are already aware of the datasets they are looking for, this search process does not generally present a problem. However, in a project of this size and scope, knowing exactly what resides in the fully-fledged DIMS-even for those most familiar with the project-will be next to impossible. And that's where "metadata" comes into play. Helena Schaefer, a metadata specialist with the National Wetlands Research Center, is creating the metadata record for every dataset and report generated by the Brown Marsh Project. According to Helena Schaefer, a USGS metadata coordinator heading up this facet of the DIMS, metadata is a database management tool that "helps document and describe all aspects of a dataset without actually being a part of the data itself." It does so by means of a set of standardized terms and formats that allows users to seek out data they may be unaware of. After Schaefer has gleaned all the crucial parameters of dataset, she then uses uniform terms and format at her disposal to create a record that accurately describes what users-those familiar with the study or not-will find within that data. This description allows users to search out datasets with great specificity, filling specific search fields, for example, with terms such as "Spartina alterniflora," "fungi," "mortality," and even latitude and longitude constraints. And although the number of datasets available through the DIMS does not yet warrant a query function, USGS is prepared to put one in place as the deluge of finalized data begins to pour in. Also falling under the rubric of the Data Management and Synthesis subproject are a paired set of tasks producing impact reports. One task examines the potential long-term consequences the dieback would have upon land loss, plant, and animal communities while the other focuses on the socioeconomic repercussions of the dieback. In charge of the former effort is Charles Sasser, a wetland habitat ecologist working with Jenneke Visser and Elaine Evers, all with LSU. Working from maps produced by USGS, Sasser explains that the "rate of land loss is the fundamental driver, the foundation that allows the vegetation and animal analyses to take place." Along with USGS maps, Sasser and his colleagues are using seasonal, time-series maps dating back to the 1950s to investigate the land loss problem with respect to landscape patterns such as the size and shape of water bodies, ridges, canals, and configuration. This historical analysis will then help formulate the likely progression of the brown marsh phenomenon were it to continue unabated, or if it were to slow, halt, or reverse completely. Although analysis of the potential vegetative decline is largely following the land loss figures, the potential impact upon animal communities requires a separate layer of input. Through a survey of the existing literature and datasets, Sasser and his team are compiling a comprehensive list of salt marsh species in the Barataria-Terrebonne estuary and their zoned, density-per-acre figures. From there, plugging these numbers into the land loss scenarios will give the analysts good working estimates of the dieback's potential impact on a wide variety of animal communities. The task of studying the socioeconomic impact of the dieback is being led by Kim Barton, an applied science project manager with Coastal Environments, Inc. As with Sasser's analysis, her analysis springs from the work being done by the USGS mapping team. In addition, her group is also getting critical land-loss projections from Sasser's group itself. Perhaps more than any other task in the entire Brown Marsh Project, Barton's effort is aimed at the public, intending, as it does, to explain both the actual and potential impact of the smooth cordgrass dieback to residents in and around the afflicted areas. The finished report, according to Barton, will base its findings on two scenarios: the impacts given a full recovery and the impacts should there be a complete dieback of the afflicted areas. Relying heavily upon federal records, especially data from the 2000 census, Barton's group is looking at population, age, and employment types in the region, and they have learned that the families populating the region have not only lived there for generations but also tend to make their living from the land. The DIMS team coordinates the storage and accessibility of every single dataset and report that the entire Brown Marsh Project is producing. 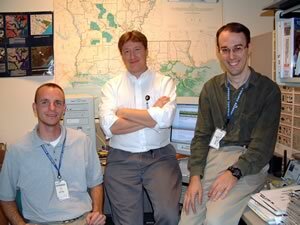 Pictured above, from left to right, are Chris Cretini, Scott Wilson, and David Guilbeau. Aside from this localized cultural dislocation, however, the potential economic impacts to the entire state of Louisiana in the "complete dieback" scenario will likely be chilling. For instance, the loss of marshes equates to the loss of protective fish nursery grounds, and revenue loss in both the commercial and recreational fishing sectors would most certainly follow. In addition, given the role of marshes as the coastal region's first line of defense against hurricanes and tropical storms, the complete dieback scenario will no doubt project severe spikes in both property loss and, accordingly, insurance rates. Also included in the Data Management and Synthesis effort are a series of milestone meetings and project reports. For example, in Spring 2003 researchers from every task within the project convened to give presentations on their efforts to date. More than a venue for interim reports, the meeting of the entire project team allowed gaps in the data collection process to emerge and the teams best equipped to fill these data gaps to be identified. In addition, two comprehensive reports are slated to be published in the spring of 2003. Heading up these reports is Dianne Lindstedt, a biologist with LSU. As Lindstedt explains, the first document her group will produce will be a technical report, a comprehensive overview-written with a scientific audience in mind-of the history, method, data, and reports of each task within the Brown Marsh Project. The technical report will then be condensed into a public report, with the emphasis placed on communicating how the crisis was dealt with, what was learned in the process, and the degree to which the state is prepared to respond to any future occurrence of the phenomenon. When looking at the landscape level changes on the scale encountered in Louisiana's brown marsh dieback, scientists have what amounts to four levels of resolution to choose from: satellite imagery, high-altitude aerial photography, lower-altitude aerial surveys, and "get-your-boots-muddy" ground assessments. All four approaches have their places in creating the composite view needed for good science to move forward, but getting the "big picture" first-be it from space or air-usually makes the most sense. 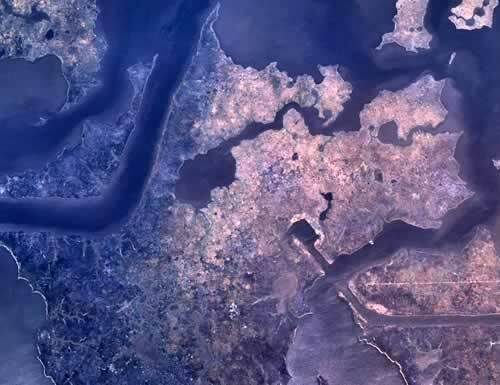 Beginning with the "biggest picture" possible, the project used the NASA platform Landsat 7, the seventh in the Landsat series and the first to employ the Enhanced Thematic Mapper sensing apparatus. 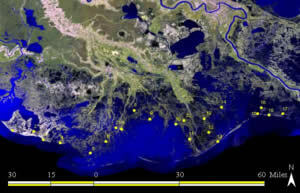 In a cooperative effort with PixSell, Inc., Andrew Beall, the remote sensing manager at the University of New Orleans (UNO) Coastal Research Laboratory, used the Landsat 7 to image the entire Louisiana coastal zone once every 16 days across the summers of 2000 and 2001. Almost as important, given the lack of a vegetative baseline, was his and his group's peek into archived images of the Barataria-Terrebonne basin taken in 1999, images taken prior to the dieback. The light bands the Enhanced Thematic Mapper can read are three visible spectra (red, green, and blue) and five nonvisible, including one near-infrared band. By simultaneously using two of the eight bands (red and near infrared), Beall and his fellow researchers were able to employ the Normalized Difference Vegetation Index (NDVI). Because the near infrared is read as reflected energy and the red is absorbed by plants, a precise coefficient of the two that represents the amount of chlorophyll present can be produced. The amount of chlorophyll, in turn, can be used to assess the health of species such as smooth cordgrass if their seasonally adjusted healthy coefficients have been previously established. Taken in August of 2000, the above image depicts the eastern half of Louisiana's coastline, with the areas most severely affected by the dieback appearing as brown. The Mississippi River, with the healthy marsh areas surrounding it appearing in green, can be seen winding its way southwest in the right hand portion of the image. Employing six of the eight spectra at their disposal, Beall's analysis of the images taken in 1999 showed nothing out of the ordinary in the Barataria-Terrebonne region, a notable finding given that this would become the area most severely affected by the dieback. The story, of course, was far different in 2000. 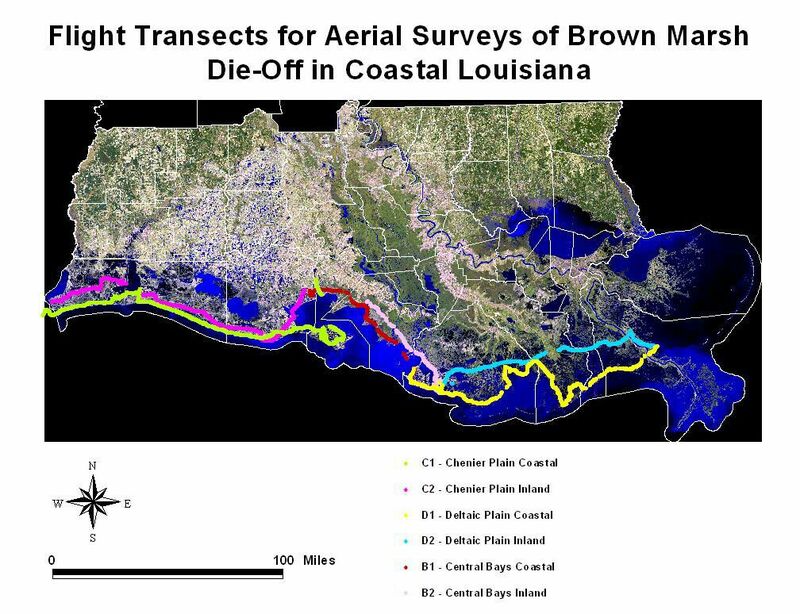 Imaging the entire Louisiana coast in seven scenes rather than the single scene that had been required to examine the Barataria-Terrebonne region, the investigators delineated their brown marsh findings into four distinct categories: severe, afflicted, impacted, and healthy. While the three classifications showing distressed smooth cordgrass could be found from the state's western chenier plains to the deltaic plains in the east, by far the greatest concentration of distressed plants-along with the greatest severity-was in the Barataria-Terrebonne region. The story in the summer of 2001, however, was different yet again. For the most part, the afflicted and impacted areas-the healthier of the three "distressed plant" categories-had shown overall improvement, with some areas improving markedly over the previous year. However, those areas that had fallen into the "severe" category the previous year remained largely unchanged. According to Andrew Beall, remote sensing was an important step in coordinating the Brown Marsh Project from the very outset. "Given its large regional scale," Beall notes, "Landsat imaging can help the aerial photographic effort proceed more efficiently by identifying potential 'hotspots' that bear closer scrutiny." Leading the way in the aerial photography and subsequent mapping efforts has been Larry Handley, a senior geographer with USGS. Overseeing the effort from the 60,000-foot flights to the hand-drawn polygons that are eventually rendered on maps themselves, Handley describes the work his team has done on the Brown Marsh Project as "pushing the envelope, the most detailed analysis we've ever done at the 1 to 24,000 scale." More than simply taking photographs and creating maps from them, the process has involved coordinating affiliated Brown Marsh Project investigators in order to determine the ground characterizations they wished to see and then, after interpreting the aerial imagery, creating maps that accurately depict these characterizations. An aerial photograph of West Terrebonne Bay, one of the dozens of photographs the Handley team took as the starting points in their mapping efforts. Even at 60,000 feet, afflicted marsh areas can be readily distinguished from their healthier counterparts. At the interface between ecology and mapping, the search for agreed-upon ground cover characterization standards is called "signature key development." To this end, one of Handley's first steps after acquiring the photography was to gather together researchers from across the various disciplines so that he could garner their viewpoints and design a signature key around their research needs. Beyond the six classifications Handley would eventually put forth, this signature key would, in effect, come to serve as the common nomenclature among researchers. To encourage this, Handley codified various research groups' pre-existing classification schemes-such as Beall's four-fold scheme above-so that they could be "cross-walked" with respect to his. In addition, he held what might be called "norming" sessions among the various project participants, so that researchers-be they on the ground, in the air, or looking at maps-could consistently distinguish among the six categories encompassing healthy to completely dead tracts of marsh. From aerial acquisition to hand-drawn polygons, Larry Handley describes how he and his team went about generating the maps used in the Brown Marsh Project. A presentation, in PowerPoint format, defining and standardizing the various categories of brown marsh, along with example images taken from high-altitude flights, low-altitude flights and at ground level. A series of nine images of the same study location taken at fairly regular intervals from early June, 2000 through January, 2002. From November, 2000 onward, the boardwalk transects used in Michot's study are clearly visible. Of course, there were still the maps themselves to produce. This effort is a complex process that involves interpreting the photography through stereo-optics so that textural, elevation, and contour details can emerge, details that provide contextual cues to the interpreters that one-dimensional analysis cannot. After these cues are identified by the interpreters, the photographs are then superimposed onto existing maps of the region by means of a light table where the signature polygons are then painstakingly hand drawn, with the smallest of polygons representing areas as little as 40 square feet. These maps were subsequently "ground-truthed" (i.e., spot-checked for accuracy by teams on the ground) before being distributed, along with the copies of the photography, to all researchers on the Brown Marsh Project. Closer to the ground by some 59,850 feet were the aerial surveys conducted by USGS wetlands ecologist Thomas Michot. A pilot with nearly 30 years experience flying the Louisiana coastline in his long-running waterfowl surveys, Michot took to the air less than a week after Linscombe's initial discovery, videotaping the various degrees of browning he witnessed along the coast. 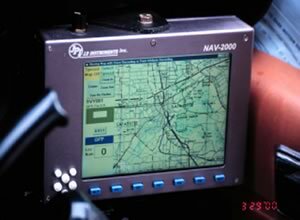 Less than two weeks after this initial reconnaissance flight, Michot was back in the air in early June 2000 with a survey protocol in place. Flying with Chris Wells, a USGS geographer with the Handley mapping team, Michot flew the coast from the middle of the state eastward in what would become the first of six transects, or flight lines, he would establish. Employing a pre-signature key four-fold classification scheme (green; mostly green with some brown; mostly brown with some green; and brown), the pair flew at 150 feet, Michot observing from the pilot's side window while Wells peered through the passenger's side. Every five seconds, each would characterize the nature of the marsh they were viewing 45° beneath them by speaking into their headset mikes. These assessments were recorded on to two separate laptops, each of which was running a global positioning satellite (GPS) program as well. The end result would be a map that recreated the flight, complete with the flight path, circular markers on the map indicating each time the mike had been opened for a comment, and an audio file of the comment associated with each marker. Over the course of the six transects, Michot and Wells would average roughly 2,500 assessments each, assessments that were then transcribed and tallied. With the aid of these initial maps, Michot was then able to accurately retrace his route along each of the transects, assuring that he and Wells were surveying the same terrain in their follow-up flight the following month. Over two years later, the pair is still making near monthly flights over the same set of transects. In the wake of brown marsh tracts rotting and disappearing altogether, they were forced to add a fifth category of "unvegetated mud flat" as they tracked the spread of the dieback and, more recently, the extent of the natural recovery process. All told, the dozens of flights Michot and Wells have flown have provided a valuable confirmation of Beall's Landsat images and Handley's maps, along with providing a much more accurate means of correlating the air and ground trends than either of the higher platforms permit. Flying less frequent helicopter surveys only 20 feet or so above the salt marshes is LDWF's Greg Linscombe, the wildlife ecologist with the Louisiana Department of Wildlife and Fisheries who first observed the brown marsh dieback in his nutria survey of May 2000. Using both input from Michot's flights and his early four-fold classification scheme, Linscombe initially flew a series of north-south transects between Four League Bay to the east and the Mississippi River to the west in August 2000. With the transects roughly two miles apart and the areas assessed at .5 mile intervals, the flights were a time-consuming but necessary process, especially given that one of the task's central purposes was to map those areas with the most severe vegetative damage. Using GPS-linked computer software similar to Michot's, Linscombe confirmed that the Terrebonne basin was the most severely impacted region in the coastal zone. More important, perhaps, was the role Linscombe's data played in helping researchers select sites for the ground-based data collection, monitoring, and remediation efforts that would soon be getting under way. Like Michot and Linscombe, the researchers involved in the first on-ground assessments knew that their surveys were exceedingly time-critical and thus began their work before the Brown Marsh Project's official inception. Led by Karen McKee, a wetland ecologist with NWRC; Irv Mendelssohn, an ecologist with Louisiana State University (LSU),;and Mike Materne, plant material specialist with NRCS, a team of investigators secured emergency funding from the Sea Grant program and immediately established 21 sampling stations (18 brown marsh sites and 3 control sites) in the fall of 2000. The team accessed sites by helicopter and measured percent plant cover by species and condition (live, standing dead, or stubble). To identify potential causes of plant dieback, they assayed the soils for texture, salinity, pH, redox potential, hydration, metals, toxins such as sulfide, and a variety of pathogens (work conducted by Ray Schneider, plant pathologist at LSU). Even at this early stage, however, it soon became clear that there would be no single "smoking gun" in this ecological mystery. Instead, it was this field work that led to the working hypothesis that McKee and Mendelssohn would pursue in their subsequent search for causes in the laboratory: there was an additive--if not synergistic--interplay of factors at work, some combination of causes behind the phenomenon. An added bonus of having arrived on the scene so early was the opportunity it afforded the McKee-Medelssohn-Materne team to track the brown marsh trend across time. Although three sites had recovered completely by the close of 2001, five had recovered to a moderate degree, five had recovered only slightly, and five showed no recovery whatsoever. 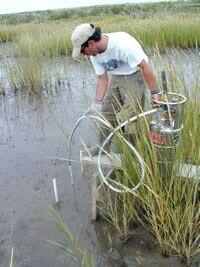 In other words, roughly 60% of the marsh in the team's sample tracts had shown little to no recovery. Given these numbers, however, the "glass-is-half-full" perspective also meant that nearly half the marsh had rebounded fairly well of its own accord over the course of a year. But as tempted as they and other researchers may have been to investigate why some areas had recovered naturally and some had not, everyone involved with the project realized that the central question still remained and, of necessity, had to be answered first-what had caused the brown marsh phenomenon in the first place? Among the dozens of researchers involved with the Brown Marsh Project, the theory that the phenomenon had been caused by some combination of causative agents soon became the general consensus. Despite this consensus, however, one single factor receiving prominent focus prior to the project's start was that of the heightened marsh salinity that accompanied the drought of 2000-01. Although some early studies reported that soil salinity levels during the period were within tolerance limits for smooth cordgrass, other studies had found that they were marginally high. More significant, perhaps, was what these initial studies agreed upon, namely that salinity levels in the region's bayous and bays had been higher than average for a far greater period than had been witnessed in the past 40 years. Several researchers, then, began to suspect a direct connection between the reduced rainfall, lowered water levels, increased salinity, and the marsh dieback. Although it would not prove the sole cause, salinity's role as a chief stressor-that is, one of the key players in the multi-causal scenario-could not be overlooked. And no matter one's opinion on this possible causal chain brought on by the drought, all agreed that the role that climate had played, especially with respect to its alteration of the salinity regime, needed to be investigated. One of the central tasks in the "Causes" subproject, then, is a thorough examination of climate and hydrological data. This includes not only a thorough accounting of the climatic factors running concurrent to the brown marsh dieback, but an investigation into how the turn-of-the century drought deviated from both the norm and previous drought periods. Heading this task are LSU's Eric Swenson, a specialist in field hydrology, and John Grymes, the state climatologist. The baseline datasets they have to work with, compared to the lack of baselines confronting some of the other researchers in the project, amount to an embarrassment of riches. The gulf coast-the large-scale context in which they are examining the dieback-not only contains 20 climate divisions, but has climate data such as temperature, rainfall, wind, and humidity dating back to 1895. Given the gulfwide nature of the drought that they observed, Swenson and Grymes asked themselves why the brown marsh phenomenon appeared to be concentrated only in certain portions of coastal Louisiana. Part of the answer had to do with the length of the drought. As Swenson notes, "You have to go back to 1963-64 to find a gulfwide drought as severe as that of 2000-01, and even then, it was not nearly so prolonged." 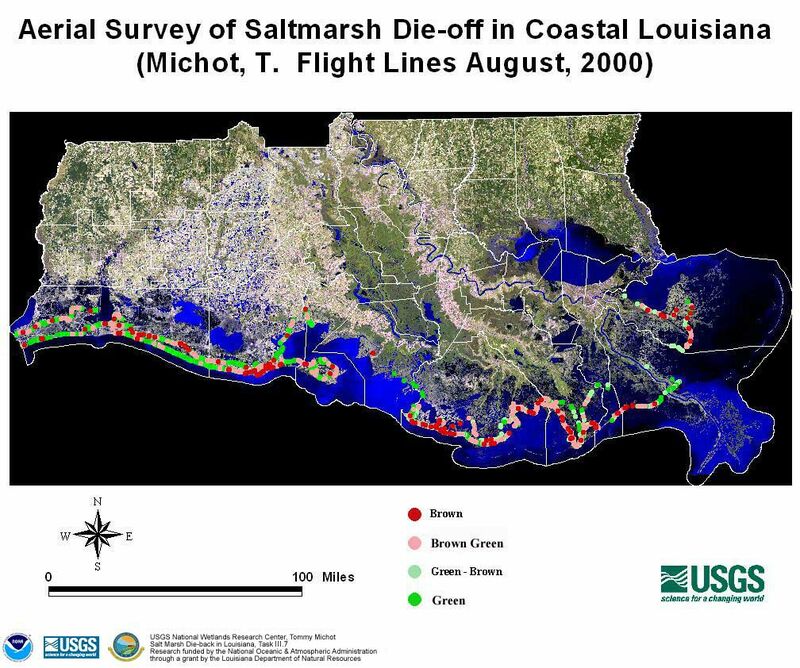 More important in terms of the impact on coastal Louisiana, however, was that this prolonged dry period in the gulf was occurring at the same time as an extremely low flow rate in the Mississippi River, a rate that in turn affected the salinity of the coastal waters. In addition to these conditions, they are investigating what role, if any, that wind may have played. Preliminary reviews of the data suggest that winds were more westerly (i.e., drier and warmer) than usual across the period in question, a factor that may have contributed to above normal evaporation rates, thereby furthering the hydrological drawdown and salinity concentrations in the marshes. 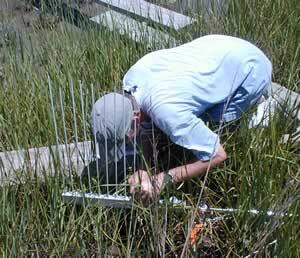 Part of the Perez-Swarzenski team, Brad Segura uses a rod surface elevation table (RSET) to measure vertical marsh surface elevation change. While seemingly straightforward, this study, in fact, is a perfect illustration of the sorts of complexities that are confronted while investigating the brown marsh phenomenon as a whole. For instance, there is a gradual change, or gradient, in soil hydrology mechanisms the farther one moves away from surface water. Soils nearest the water tend to receive more lateral than vertical hydration; the farther one moves away from the water source, the balance tips the other direction, with some areas completely dependent on precipitation and runoff. Because it had already been established that smooth cordgrass plants along marsh edges were healthier, the initial problem in designing a study was to find near-neighboring tracts of brown and healthy marsh equidistant from surface water sources so that like settings could be compared. Yet even this task had its complications, namely because of the compaction and subsidence already taking place in the severely affected brown marsh zones. In other words, not only did the distance from surface water have to be roughly equal, but the elevation of the healthy and afflicted tracts with respect to the surface water had to be selected for as well. In addition, because Perez and Swarzenski's team wanted to discover the role salinity played in the dieback, they were keen to have the paired sites occur in areas that were susceptible to broad fluctuations in salinity across the course of a year. Using a cryogenic coring technique, sediments are solidified for ready, accurate analysis by the Perez-Swarzenski team. Above, Troy Olney uses liquid nitrogen to freeze a sample prior to its extraction. In the end, the team found four suitable sites with a range of soil types between Bayou Lafourche and Fourleague Bay in which study pairs some 40-50 meters inland could be created: (1) Old Oyster Bayou, nourished by the Atchafalaya's freshwater pulses in the spring and characterized by a clay and fine-silt mineral marsh; (2) Bay Junop, also affected by the Atchafalaya, but characterized by a clayey mineral marsh; (3) Bayou Sale, a site that is affected by the hydrology associated with the Houma Navigation canal and characterized by a more organic marsh; and (4) Lake Felicity, a site entirely dependent upon precipitation and rainfall for its freshwater input and the site with the highest level of organic material (nearly 50%) in its substrate. As far as the question of salinity and its role as the primary causative agent is concerned, according to Perez, the results from these four paired sites indicate that "salinity alone was not the causative factor." If that had been the case, a threshold event that would have caused any one tract to brown would have most certainly caused its adjacent counterpart--equidistant from surface water and at the same elevation--to do so as well. The question of soil type and its ability to store water, however, is more complicated than the teams findings regarding salinity. Based on preliminary results Faulkner and Gambrell have observed differences in the iron and sulfur chemistry, both of which are sensitive to changes in hydrology. The brown marshes generally have less pyrite and acid-volatile sulfides than the paired healthy marshes in the soils' upper 15 centimeters, a zone where the water table was lowered by the drought. This finding supports their original hypothesis that the drought caused reduced sulfides to oxidize with the potential to increase acidity and soluble metals. Since this is an observation of current field conditions, the results of the laboratory and greenhouse studies will be necessary to help verify the oxidation of sulfides as a primary causative agent. Another field study is taking an approach that integrates the analysis of both soil characteristics and plant response. Headed by Thomas Michot, an ecologist with USGS, the study is taking place upon the same four pairs of sites that Perez and Swarzenski are studying. While Michot and his group are likewise interested in soil characteristics, they are approaching their task from a physiochemical standpoint. In addition, the team is looking at smooth cordgrass vigor and surveying transects across the eight shared sites to create broader plant species inventories intended to track the natural recovery process of dead and browned areas. One of the many fixed sample plots being employed by the Michot study team. The physiochemical variables the Michot group are tracking include salinity, pH, sulfides, nutrients (e.g., nitrates, phosphates, and ammonia), and what soil specialists call "redox," the reduction/oxidation potential of the soil (Eh). Their samples are being gathered monthly from four randomly selected one-square-meter plots within each site and are taken at three different depths: the soil surface, 15 centimeters, and 30 centimeters. Within these same plots, the group is also making an array of plant health measurements, including the ratio of live to dead plants, average plant height, maximum height, stem counts, and a three-fold quality assessment of overall plant health. The group is hoping to learn about the variety and associated effects, if any, of soil chemistries upon plant health, not only in the like-to-like soil-settings of the healthy and afflicted pairs, but across the range of soils found in Old Oyster Bayou, Bay Junop, Bayou Sale, and Lake Felicity. One of the several boardwalk transects that Michot's team constructed. The boardwalk allows the team to assess plant species makeup as afflicted areas, such as this one, revegetate. Finally, in what might be thought of as an extension of the "Status and Trends" subproject, the team is surveying eight transects, one for each site in the study's 2 x 4 design. The healthy sites, made up almost completely of smooth cordgrass, serve as references to the afflicted sites, some of which had turned to mud flats at the height of the dieback. As the afflicted areas revegetate, Michot's team is tracking both the rate of revegetation as well as the multispecies colonization and succession processes as the denuded areas return to largely homogenous tracts of smooth cordgrass. Karen McKee and Irv Mendelssohn, the same investigators who were among the first to establish study sites on the ground, are heading up a multi-faceted laboratory task which, by virtue of its experimental nature and the broad range of disciplines involved, has to be considered one of the cornerstones of the entire Brown Marsh Project. The effort is split between LSU and NWRC, and the experiments draw on the expertise of plant ecologists, plant physiologists and plant pathologists in a coordinated effort to first examine variables in isolation and, subsequently, in combination. At first glance, those unfamiliar with the project would likely find it odd that, as Mendelssohn puts it, "a group of experts was assembled in order to kill plants in a variety of ways." While the scientists, of course, are mostly interested in learning what it takes to kill smooth cordgrass, they also included blackneedlerush (Juncus roemerianus) and black mangrove (Avicennia germinans) as controls representative of other plant species found in the same natural settings as smooth cordgrass yet did not die back or even show signs of stress. In brief, the experimental design calls for ever-increasing levels of stressors (e.g., salinity, acidification, moisture reduction, aluminum, and iron) to be applied to the three species and measurements of their responses. Pathogenic fungi are being investigated by Ray Schneider (LSU) in separate experiments. Each stressor is being escalated at 2-week intervals while all other factors are held constant (e.g., aluminum levels would be gradually increased while salinity, pH, and the other variables are held at optimal constants). In addition to an unmanipulated control group for each of these isolates, a third group has been created to mimic any chronic conditions that smooth cordgrass may have been exposed to in the wild. As Mark Hester, a coastal plant ecologist with UNO working on the experiment, explains it, while one experimental group continued to have stress placed upon it until mortality, the other experimental group's stressor level was held at the point at which the visible onset of plant stress was observed, helping the researchers understand the function of time with respect to stress levels that are otherwise seemingly nonlethal. Moreover, this design fits neatly with the task's mission to examine both short- and long-term growth responses. Hester's role in the McKee-Mendelssohn trials amounts to measuring photosynthetic response in the short-term, measures that will then be compared to plant biomass responses. As far as photosynthetic response is concerned, Hester uses a "photosystem," a closed-chamber instrument that, given a known leaf area, uses light, water vapor, and carbon dioxide to calculate the rate of photosynthesis occurring within a sample. The amount of photosynthetic activity, in turn, provides a good index of overall plant health. Echoing the findings of other researchers, Hester's preliminary results suggest that salinity alone is not the culprit. "Salt is an important stressor in coastal plant communities and may have been involved," he states, "but it cannot the only factor behind the dieback." During the salinity stressor experiment blackneedle rush succumbed to the increasing salinity levels before the smooth cordgrass. Hester explains that "this is not in agreement with what was observed in the field where black needlerush was often observed to be relatively healthy among the dead stems of smooth cordgrass in the dieback areas. 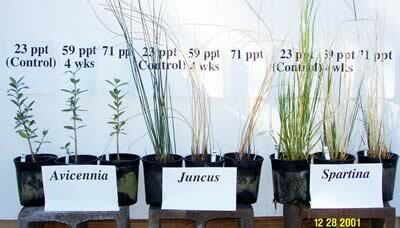 Therefore, some factor(s) beyond salinity stress appear(s) to be involved in the sudden marsh dieback." The picture above demonstrates the responses of the three species in the McKee-Mendelssohn trials to a variety of salinity regimes. The effects of increased exposure to salinity upon black needlerush (Juncus) and smooth cordgrass (Spartina) are clearly visible. On the other hand, the black mangroves (Avicennia) show no outward signs of salinity-induced stress. Hester's previous research-where he subjected 25 different genotypes of smooth cordgrass to increasing salinity stress--is in agreement with the current findings. Although he found significant variation between genotypes, the salinity level that resulted in 50% death of aboveground tissue (similar to an LD50) ranged from 83 ppt to 115 ppt, with a median above 100 ppt. 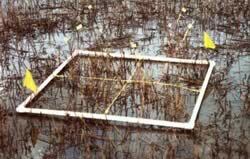 Therefore, Hester feels confident that salinity stress was not the only factor involved in the sudden marsh dieback. According to Mendelssohn, the role of soil acidification is different from that displayed by salinity. In the isolate pH trials, the team began with a pH level of 6.5 and lowered it (i.e., made it more acidic) by 0.5 on the scale every 2 weeks. The sublethal stress level in black needlerush, black mangrove, and smooth cordgrass became apparent at a pH of 2.5, and that became the chronic experimental level they would hold while the acute group continued to drop. After several months of this sustained level of acidification, smooth cordgrass in the "hold" group showed a severe decline from the point at which the pH level was fixed at 2.5. Across this same period, however, black needlerush and black mangrove showed no appreciable difference in their growth response to this sustained, chronic exposure. Hence, the preliminary results show that pH stress response across the three species matches the dieback pattern observed in the field, suggesting that acidic soil may be a possible cause behind the dieback. Field surveys did indicate much lower than normal pH values in some dieback areas, although not as low a pH as that reached in the laboratory trials. Thus, all of the single factor trials demonstrate that the three species tested in laboratory trials show different tolerances of the stresses thought to be involved in the dieback. Moreover, species response patterns support pH, but not salinity, as a major factor potentially causing smooth cordgrass dieback. However, salinity may have played a secondary role, and this interaction will be tested in upcoming experiment to be conducted at NWRC by Karen McKee (see McKee video). One theory from the outset had been that drought had led to soil acidification, an effect that increased the concentration and "bioavailability"of toxic metals such as aluminum and iron in the soils. Mendelsshon explains the pH isolate trial in one of his many growth chambers at LSU. McKee discusses the methodology and setup of her multi-factor combination trials. Soils that develop within estuarine environments may contain pyrite and other metal-sulfide compounds that can be readily oxidized, and when water levels are drawn down as severely as they were during the 2000-01 drought, the heightened aeration (i.e., exposure to air) of the soils increases opportunities for oxidation. This oxidation process, in turn, increases the acid levels in the soils. But as pH decreases linearly, the solubility of aluminum and iron, or the rate at which these metals can dissolve into the immediate environment, is increased several fold. Hence, McKee is looking at these metals in separate isolate trials being conducted at the National Wetlands Research Center, increasing their concentrations at 2-week intervals until mortality is reached in the acute groups while holding at a stress-inducing level in the chronic group. The role pathogens may have played in the brown marsh dieback is perhaps the most troublesome causal isolate the team is pursuing. Heading up this facet of the research trials is Ray Schneider, a plant pathologist with the LSU Agricultural Center. Because of the specific cluster of symptoms--browning, leaf death, and root rot--Schneider's experience has led him to suspect pathogenic fungi. Part of what makes Schneider's job difficult is that even though he examined the very first samples that the McKee-Mendelssohn team brought back from the field, he was, in essence, starting too late because a whole host of secondary invaders had arrived, opportunistic invaders that can only flourish on already diseased or dying plants. Moreover, healthy smooth cordgrass, as is the case with most plant species, has a broad range of what Schneider calls "fungal microflora" active within it. In much the same way many humans carry pneumonia pathogens within them and only become symptomatic after their immune systems become lowered while fighting off other disease agents, many of the 100-plus fungi Schneider found in diseased smooth cordgrass are present in healthy specimens as well but can explode to pathogenic levels when a plant is stressed. And to complicate the picture even further, the literature is full of fungi that appear together only in "complexes." For example, while one fungus may cause stunting, one yellowing, and one seedling disease, rarely do any of the three appear in a plant without the other two appearing as well. Despite these complexities, Schneider is forging ahead with his work, separating the secondary invaders from those typically found in smooth cordgrass microflora and identifying those which usually appear only as part of fungal complexes. But even as he goes about the business of inoculating healthy plants with these various fungi and observing their progress, the McKee-Mendelssohn team is planning its next phase of study: combination trials. Because more than one stress factor may have been involved in the brown marsh phenomenon, the plan is to experimentally test three factors simultaneously to see if the dieback can be produced in the lab in that fashion. Karen McKee, the team member who will manage this aspect of the task, has already decided that salinity and pH will be two factors she will include, but her final decision will be based on the outcome of the single-factor trials. One needs only to think of the numerous combinations possible to realize the complexity of McKee's undertaking. For instance, she could place salinity at 30 ppt, pH at 4.0, and introduce pathogen x, or she could place salinity at 20 ppt, pH at 3.0, and introduce metals at a level of y. In other words, the range of possible causative combinations, while not endless because they will be restricted by the range of field measures, is certainly daunting. These short-term stress experiments will be complemented by a long-running research task in which sections of marsh are subjected to combinations of factors. The two approaches will together have a better chance of identifying the causal agents in the dieback than either one alone. Robert Twilley, a wetland ecosystem ecologist with the University of Louisiana, Lafayette (UL), along with collaborators from NWRC, LSU, and UNO is recreating environmental factors in aggregate through a manipulation of greenhouse conditions at UL's Center for Ecology and Environmental Technology, an approach that is designed to mimic the overall effects of drought conditions. 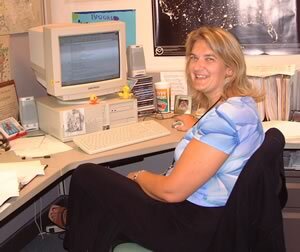 Twilley is responsible for the overall experimental set-up and logistics of the experiment as well as participating in data collection. Mendelssohn (LSU) and McKee's (NWRC) team is responsible for tracking biomass, with Mark Hester (UNO), in particular, tracking photosynthesis responses of the vegetation. Stephen Faulkner, a biogeochemical ecologist with NWRC, and Robert Gambrell, a wetland biogeochemist with LSU, are monitoring changes in soil chemistry. In addition, Ray Schneider (LSU) is looking at pathogenic fungi that may be enhanced by the experimental stresses. Twilley explains the way in which his greenhouse study aims to recreate the drought conditions across varied soil types. The investigators have moved 180 5-gallon buckets of smooth cordgrass and its surrounding soil from three differing soil-type sites: Lake Felicity (organic), Bay Junop (clay), and Grand Isle (sand). In what amounts to a study in forensic, after-the-fact ecology, Twilley states, "The whole point is to re-create the climate conditions we weren't in place to observe, then link these to hydrology, link the hydrology to the soil conditions, and, ultimately, link the soil conditions to plant vigor." More than simply meeting the broader goal of recreating drought conditions, this research group's multidisciplinary study has to be considered another one of the project's cornerstone tasks, one that harbors a complex experimental design that puts all 180 buckets the team collected to good use. For example, each soil type is exposed to two distinct salinity regimes, one of which is held at 15 ppt while the other is held at 30 ppt. Stephanie Cogburn takes a porewater sample for chemical analysis. Each of these soil type-salinity pairings is then treated to three varied water deficit intervals representing the range of tidal pulses they would see in the marshes, that is, a pulse each day, a pulse every seven days, and a monthly pulse. Finally, given the fact that the drought was measured in terms of both a hydrologic drawdown and a lack of rainfall, these 18 different soil type-salinity-tidal pulse groups are each treated to two sets of precipitation conditions: one with simulated historic rainfall and one with none whatsoever. All told, then, there are 36 separate sets of unique conditions to observe, and although the study is ongoing, a pattern is beginning to emerge. According to Twilley, the smooth cordgrass plants in the sandy soils are having the toughest time in the low-pulse, no-rain scenarios. It is just this sort of observation of factors working in aggregate that the greenhouse research group had hoped to re-create. The results of the long-term greenhouse experiment, which will provide detailed information about changes in soil chemistry and plant mortality under native soil conditions, will be important in interpretation of the experiments the McKee-Mendelssohn team is conducting. Robert Twilley is also taking the lead in the Brown Marsh Project's computer modeling efforts. Because investigative teams weren't in place to observe the dieback as it was beginning to unfold, the design and implementation of a computer model will allow researchers to create a variety of "hindcast" scenarios, scenarios not intended to predict the future but reconstruct the past. Given the enormous range of data types the modeling team has to work with and the variety of scales that have to be depicted in their effort, the modeling work underway is, without a doubt, the most highly integrated single task in the entire Brown Marsh Project. To create a viable dynamic model, Twilley drew on the resources of several modeling teams that had never worked together. The first of these was LSU's's landscape modeling group, a group that worked at the 10,000-square-kilometer scale with Swenson and Gryme's climate factors such as wind conditions, salinities, water levels, and river flow. With this model in place, Twilley enlisted the help of UL's Ehab Meselhe, a modeler who works at the one-square-kilometer scale. Meselhe took the LSU team's conditions and ran his smaller "segment" model to produce far more localized pictures of water level and salinity based upon landscape elevation contours derived from Handley's mapping team. However, because these models were largely geared toward flooding simulations, they simply went to zero on the hydrological scale and stopped. In other words, they had no parameters built into them to help recreate the impact of water deficits. Hence, Twilley used a variant of a preexisting hydrological model he had previously developed that could account for negative hydrological coefficients, one that he had tweaked to simulate mangrove response during drawdown periods. Yet despite this extensive integration of model types and scales, there was still one crucial aspect missing: a vegetative model that included smooth cordgrass. For this final aspect of the effort, Twilley called on Jim Morris, a plant habitat modeling specialist from the University of South Carolina whose work focuses on Spartina grasses. With his help, they overlaid his model on top of the others so that it would "grow" based upon the values plugged in to the fully integrated suite. As with many of the project areas within the larger Brown Marsh Project, efforts aimed at creating remediation strategies began prior to the project's official start date. Greg Grandy, senior project manager for the Louisiana Department of Natural Resources (LDNR), wasted no time in putting the groundwork for remediation efforts in place. Using Greg Linscombe's fly-overs and the McKee-Mendelssohn team's 21 plots as a starting point, Grandy commissioned a series of helicopter overflights intended to assess the dieback from a remediation-specific standpoint. Prior to the detailed classification protocol put forward by Handley and the mapping team at USGS, this "quick and dirty" assessment guided the formulation of the remediation projects, allowing the remediation specialists to proceed even as the search for causes was getting under way. One of the experts central to the project's remediation studies is Mike Materne, a coastal wetlands plant specialist with the Natural Resources Conservation Service (NRCS). A researcher at NRCS's Golden Meadow Plant Materials Center, Materne brings a history of specialized, applied research to the problem at hand, having released a "cultivar," or "cultivated variety," of smooth cordgrass with heightened salinity and water tolerance in 1989. Given this experience and his early involvement with the dieback, Materne was eventually charged with heading up three principal tasks in the Brown Marsh Project. The first task is an "accession characterization," the second involves aerial seeding trials, and the third examines the viability of the on-the-ground placement of treatment plots in critical areas, areas such as those under the erosive force of high wave energy. Materne's accession study is an effort to cultivate various "ecotypes" from among the survivors at the McKee-Mendelssohn team's 21 test plots and subsequently test their heartiness by placing them back into three severely affected sites in the Terrebonne and Lafourche basins. In botanical terms, "ecotype" refers to a population within a species that exhibits genetic adaptation to a specific local environment and whose phenotype-that is, unique physical characteristics-survives transplantation into new surroundings. Materne's group allowed the 40 separate ecotypes they identified to propagate by the rhizomal method, the same method of extending horizontal, subsurface runners that causes grass to fill barren soil in suburban lawns. With plots of the 40 ecotypes planted in the three severely affected areas, Materne's research group is measuring a number of heartiness indices in each, among them plant productivity, the number of seeds produced, their mass, and height. But chief among the characteristics they are keen on observing are the survivorship rates. After determining the handful of ecotypes with the highest survival rates, Materne plans to select among this narrowed group for the highest productivity, as these would be the best candidates for replanting and reseeding efforts. Moreover, given the presence of aluminum and iron discovered in the original soil assays, Materne's group is in the process of examining survivorship and productivity in relationship to the presence of these metals. And according to Materne, "Even if the most metal tolerant ecotype turns out to be the scrawniest of the 40, it will still make a tempting candidate for crossbreeding with the most productive." Such crossbreeding, should it occur, would occur by way of seed-based, sexual germination. Germination in smooth cordgrass, as with many grasses, is a little used secondary reproductive system in a plant that has spent eons largely reproducing via asexual, vegetative means. Nevertheless, restoring vast expanses of brown marsh by means of aerial reseeding is the focus of Materne's second remediation task. When asked by Governor Foster at the outset of the dieback whether the brown marsh could be replaced, Materne and other scientists could do little more than give the Governor a flat "no" for an answer. Given that smooth cordgrass purchased in bulk for smaller, ground-based restoration efforts costs $6.00 per plant, the massive reach of the impacted areas, and the labor cost that would have been required, the price tag of a planting program was clearly far too prohibitive. Seeding smooth cordgrass, however, comes with its own set of problems. Not only do the seeds mature slowly, they mature in what botanists refer to as "indeterminate inflorescence," meaning the seeds are in a variety of developmental stages at any one time on any one plant. In nature, the seed would be dropped into the water where it would spend the winter before germinating in the spring. Hence, seed storage requires water kept slightly above freezing, along with the addition of salt or some other fungicidal agent. Over and above the problems inherent in collection and storage, however, Materne's team also had the mechanics of the seeding process to work out as well. More than simply dropping seeds and hoping they would produce results, the goal was to examine both germination and seedling survival rates in an effort to establish the most efficient seed density. To this end, Materne conducted three trials in the spring of 2001: one serving as a freshwater control group, one in Bayou Lafourche, and the third in Lake Felicity. As expected, while the germination rate was 75% in the control group, the fresh water setting allowed no seedling survival. At Bayou Lafourche, there was a 40% germination rate, but, once again, no measurable seedling survival. At Lake Felicity, however, not only was the germination rate 40%, but 35% of the seeds that germinated went on to become viable seedlings. With the freshwater control demonstrating that germination rates higher than 40% were possible, Materne and his group then set about the business of selecting seeds for their germination and survival rates. Combining this with their previously measured rates from the Bayou Lafourche and Lake Felicity trials, for their second study in the spring of 2002, the team calculated that 70 seeds per square foot (30 pounds of seed per acre) would likely result in the on-ground density of 10-15 plants per square foot needed for the grass to take hold and propagate on its own. And while the ultimate survivorship of the smooth cordgrass has yet to be determined as of fall 2002, the initial results seem to indicate that Materne's group has hit its target. The 25-acre study area had a 60% germination rate and a subsequent 50% seedling survivorship, amounting to an average of 10-15 plants per square foot. Materne explains the goals of his accession study shares several examples of the varieties of smooth cordgrass he has cultivated. Moreover, Materne is confident that the collection and storage problems are on the verge of being solved, and he is "hopeful that seeded restoration will become a reality inside the next three to five years." In other words, if there should be another brown marsh dieback in, say, 2006 and the next Governor should come to the scientific community and ask if the marsh can be revegetated, chances are good that the scientists will be able to answer with a practical, cost-effective "yes." And while six years might seem to be a long time, in the world of applied science the move from a complete standstill to the ability to revegetate hundreds of thousands of afflicted acres is, in fact, "science at warp speed." The third task that Materne and affiliated researchers are heading up is an investigation of revegetating "critical target areas," marsh-edge areas that are highly resistant to aerial reseeding because they are subjected to wave energy and other erosive forces. The approach of this investigation has been to examine the viability of a third alternative to planting or seeding, namely the placement of fiber mats impregnated with smooth cordgrass material. Materne's group has anchored two types of mats in large sections within critical areas, and they are testing the mats themselves for durability. More important than mere durability, they are also examining three various methods of impregnating the mats: seeds, shredded rhizomal matter, and plants themselves. The success of these methods in environments especially sensitive to the vagaries of seasonal events such as tropical storms calls for extended trials before "success" can be accurately measured. However, Materne is hopeful that a "cost-effective middle path" may eventually be achieved, a means that may prove crucial to restoring the protective, outermost edges of the marsh. A final remediation task that began in July 2002 involve the placement of nutrient-rich dredged material in Bayou Lafourche, one of the areas most severely affected by the dieback. Headed by Greg Grandy, the plan calls for thin layers of material to be placed in severely compromised areas in six-, nine-, and twelve-inch layers. Although the increased elevation these layers will create will likely provide some small degree of boost to smooth cordgrass tracts that are having trouble coping with subsidence-related water levels, the main interest for Grandy and his team is the role, if any, that the nutrients within the dredged material can play in helping dead and struggling areas regain their vigor. Once this series of vegetative platforms is established in the fall of 2002, some will be set aside to receive vegetative plantings derived from McKee-Mendelssohn's laboratory studies and Materne's field work. 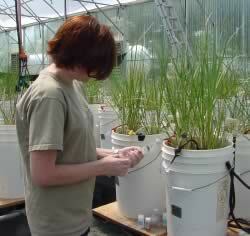 For the most part, the vegetative studies will follow the McKee-Mendelssohn team's experimental design, planting black needlerush and black mangrove along with smooth cordgrass so that the success of each species and smooth cordgrass ecotype can be monitored with respect to the others. In addition, Grandy's forthcoming field trials will involve two additional indigenous species, saltgrass (Distichlis spicata) and saltmeadow cordgrass (Spartina patens). If storm clouds tend to contain silver linings, then perhaps the research teams engaged in the Brown Marsh Project are beginning to realize that droughts can harbor them as well. Given the enormity of the problem undertaken, confronting the brown marsh dieback has also produced enormous results for Louisiana's coastal science community. Susan Heyel, a reseach associate participating in Twilley's greenhouse studies, using ink to stain microrhizal fungi. A recent graduate with a MS in Biology with Old Dominion University, Heyel was instrumental in arranging the physical design of the greenhouse experiments. Greg Grandy, the lead manager for the entire Brown Marsh Project, notes that, "The quality and pace with which we've conducted our research has really put Louisiana's coastal science program on the map." And given that wetlands across the world, from Holland to Vietnam, are facing land-loss challenges similar to those found in south Louisiana, the map Grandy speaks of is not simply national in scope but global. If the brown marsh phenomenon should pop up anywhere across the globe in the near future, those called in to solve the problem will owe a sizable debt to the work done in south Louisiana. Achieving an international profile, aside from the pride those involved can rightly take from it, also brings a much-needed focus to the larger plight facing Louisiana's coastline. For the better part of two decades now, wetland researchers in the state have been sounding alarms over the vanishing coast, only to find that warnings were falling largely on deaf ears. But the quality of the team-oriented, rapid-response science that has addressed the crisis has assured that these concerns are now being met with an increased measure of respect. Several of the graduate students working on Twilley's greenhouse study. Another benefit is the unparalleled hands-on opportunity this has given a younger generation of researchers. Given the sheer amount of individual publications that brown marsh research has produced and will continue to generate, recent graduates in a wide range of wetland-related fields, along with graduate students, are carving out research niches that may well have taken their mentors the better part of a decade to achieve early in their careers. This early opportunity, as Robert Twilley notes, "helps guarantee that a strong field of researchers will be in place as wetland restoration efforts continue to move forward." In the face of a continuing decline in coastal wetlands acreage, Louisiana is on the verge of what may prove to be the largest ecological restoration effort in history. Decades of research and over 12 years of the Breaux Act's applied efforts to assist those areas under the greatest threat have taught Louisiana's coastal preservation community a good deal about what works and what doesn't. Under the auspices of the Coast 2050 Feasibility Study, a task force that includes several researchers involved in the Brown Marsh Project, the state of Louisiana, with cooperation from the U.S. Army Corps of Engineers, is in the midst of putting together a scientific, engineering, and design proposal that will be sent to the U. S. Congress requesting some $14 - $15 billion dollars for wetlands restoration in Louisiana. By comparison, Florida's Everglades Project, which is currently the largest ecological restoration project in U.S. history, is being funded to the tune of $7.5 billion. As far as the dieback itself is concerned, we will all have to wait until the Brown Marsh Project's final reports are published in the spring of 2003 to find out the certainty with which any ultimate causes can be ascribed. But two things seem to be clear at this point. The first is that should the phenomenon ever strike south Louisiana again, the state will have both a broad knowledge-base and specific remediation strategies at its disposal, resources that were not there before. The other is that the Louisiana coastal science community has left its stamp on the world of multi-disciplinary ecosystem study and is fully prepared to do whatever it takes in order to save the vanishing treasure that is the state's coast.